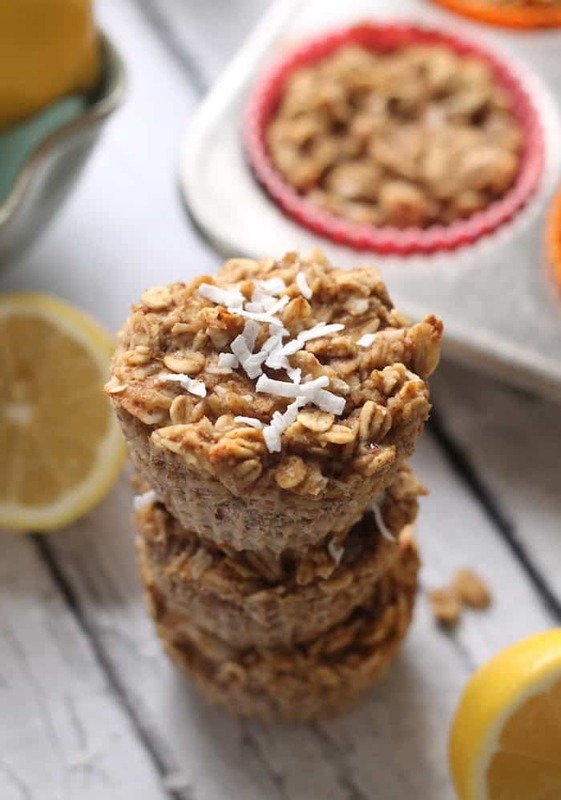 Moist and delicious Lemon Coconut Baked Oatmeal Cups with no added sugar make the perfect healthy breakfast on the go! Vegan and gluten-free. So is it totally bizarre that I never really make baked oatmeal in a pan but am currently head over heels obsessed with these little cuppies?! 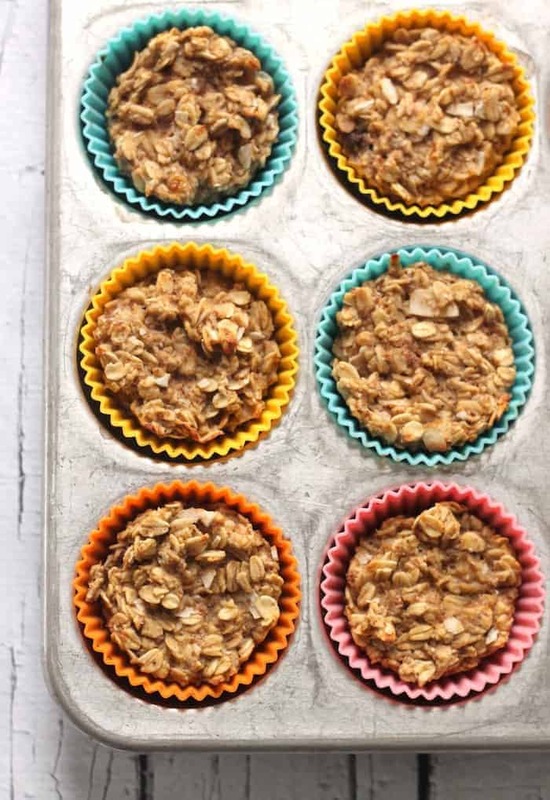 They’re essentially baked oatmeal in perfect, portioned, portable form. It’s not like it’s that hard to use a spatula and cut a square from a pan, but there’s something truly magical about the good old muffin tin. When my blogging boos and I decided to make citrus the theme for January’s round-up, I immediately turned to lemon and then immediately turned to coconut. Ahem, match made in foodie heaven. I messed around with the proportions in the cooler older cousin version of this recipe (Banana Zucchini Baked Oatmeal Cups) since winter isn’t zucchini’s best friend, thus opening up a whole new world of portable oaty greatness. By the way, I’m all googly eyes for these silicone baking cups. They make clean-up a total breeze! Oh an since I know half of you are going to ask, I went ahead and calculated the nutrition information. One muffin (without the optional maple syrup) has 116 calories, 5 grams of fat, 16 grams of carbs, 3 grams of fiber, 5 grams of sugar, and 4 grams of protein. I really liked the subtle natural sweetness of using just ripe banana, but feel free to add maple syrup if you like things sweeter. But remember, they’re meant to be a breakfast or snack option, not dessert! They’re moist, totally vegan, gluten-free, and have ZERO added sugar or oil. Hellooooo most perfect breakfast how are youuuuUUuuUUUU. Place flax and water in a small bowl. Stir to combine. Set aside. Place bananas in a large mixing bowl. Mash with a fork. Add almond butter, almond milk, optional maple syrup, lemon juice, lemon zest, vanilla, and flax eggs. Stir until well-combined. Add oats, baking powder, coconut, and salt, stirring to combine. Spoon batter evenly into muffin tin (you may have leftover batter. I made some mini muffins). Bake for 20-25 minutes, or until set and lightly browned. Cool for 20 minutes on a cooling rack before carefully removing from muffin tin. I’ve have been obsessed with baked oatmeal cups lately since I haven’t had time to have a sit down breakfast in the morning. I love this combo of lemon and coconut, makes me think of summer! These look amazing! 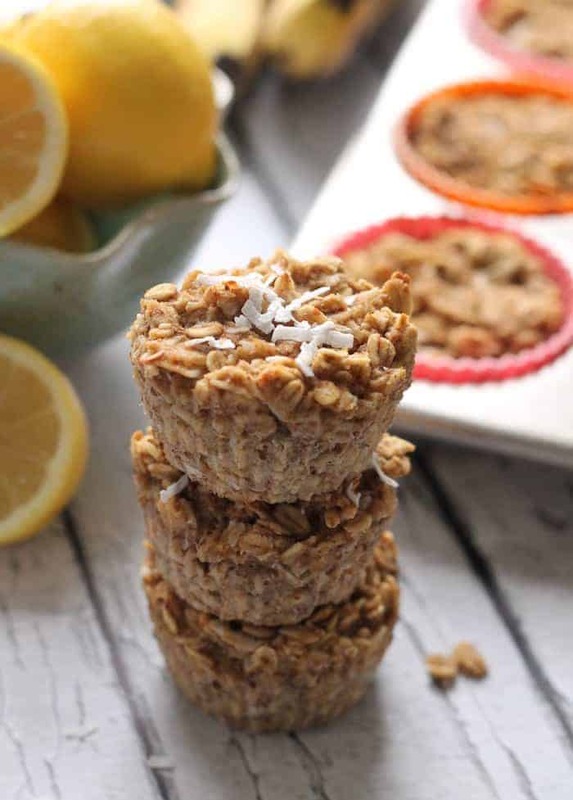 Can I make the Lemon Coconut Oatmeal cups without FLAXSEED? Just use the eggs? There are not enough lemon desserts/treats in my life! Love the combo with coconut! These look delicious!! I love everything coconut right now. I will definitely be picking up some of those baking cups – what a great idea!! These look freakin’ AWESOME! And they totally remind me of your lemon coconut no-bake bites, which I currently have a stash of in my fridge. Have yet to find a no-bake bite that tops those bad boys. Can’t wait to try these cups! lemon and coconut = i die. Everything tastes better in mini size :D And how have I never thought to add citrus to oats?!? Amg that sounds ah.maze.ing. Lemon-y coconut-y dreeeeam bites! :D these look incredible! Just made the Apple Ginger Oatcakes from the Full Helping and now these lemon coconut beauties are next on my list!! Yum!! Did I miss where you add the flax and egg that was set aside?? I just added it in at the end…hopefully they turn out because they look so good!! I am not a fan of bananas but really want to make this. What can I substitute them with? I hate bananas and my husband is allergic. It can be frustrating to find healthy recipes when everyone subs in bananas. I think mango might be a good one to substitute here. I’ve also heard that applesauce can be subbed for banana in recipes. It might be too moist though so maybe add some avocado in with the applesauce too? I’m not really sure but it might be worth a try. I’m thinking I will try one of those two options, myself. Anybody have any other suggestions? I made these this morning and looking forward to eating them! HOWEVER, in your directions, you never tell when to add the eggs.!! I added them to the wet ingredients, but thought you should revise your directions for others. Love your recipes. Awesome! Thanks for pointing that out. Just fixed it! I’m allergic to nuts. Any substitutes for almond butter? I agree with Cathy! I just made these and didn’t see anywhere to add the eggs. Please update, but excited to try these when they come out of the oven or in the AM! It’s in step #3–edited yesterday! Just add to wet ingredients. EnjoY!